We will be releasing new Podcasts each month, subscribe to the WAF newsletter to be kept informed of when a new Podcast is released. Alex McDowell is the creative director at 5D Global Studio, a multi-platform cross discipline design studio. He is a strong advocate of world building and immersive design and integrates digital technology and traditional design techniques into his work. 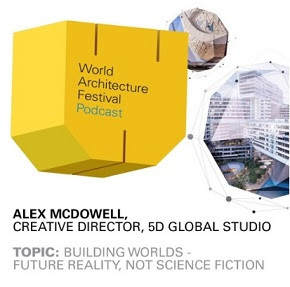 Listen to his keynote speech from WAF 2015 on the future of building worlds. Leading women architects share their personal experiences and discuss the challenges and opportunities facing women in the global profession. Christine Murray, editor of the AR, interviews Will Alsop as he paints live at WAF 2015. Hear directly from the 2015 winners and get a taste of what to expect at WAF 2016 in Berlin! The WAF Awards 2016 are now open for entries. Raise your profile internationally, enter new markets and prove yourself on a global stage. Learn more about submitting an entry.